LONG BEACH, Calif. – A beautiful new image snapped by a NASA spacecraft captures the aftermath of a massive star explosion with unprecedented resolution. The image — taken by NASA's NuSTAR spacecraft (short for Nuclear Spectroscopic Telescope Array) in X-ray light — shows Cassiopeia-A, a supernova remnant located about 11,000 light-years from Earth. Light from the violent explosion first reached Earth about 300 years ago, researchers said. The blue ring is made up of high-energy X-ray light. The ring formed when the shock wave from the star's death crashed into nearby particles, accelerating them to nearly the speed of light. The new image provides an incredibly detailed view of the star's death. 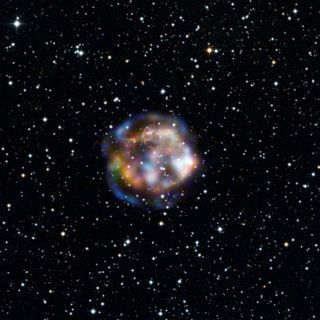 With earlier technology, such as that provided by NASA's Chandra X-Ray Observatory, the entire supernova explosion would have appeared as a single dot, said NuSTAR principal investigator Fiona Harrison, an astrophysicist at the California Institute of Technology in Pasadena. The $165 million NuSTAR spacecraft launched in June 2012 on a two-year mission to probe high-energy regions of the universe, such as black holes and supernova remnants. The spacecraft should help researchers better understand how galaxies form and how black holes grow, Harrison has said. Follow Space.com on Twitter @livescience. We're also on Facebook & Google+.